Overwatch’s characters ooze personality. Sometimes, they literally ooze it. It might look all wrong, but it’s 100 percent intentional, a byproduct of some very particular animation techniques. If you’re a frequenter (oh hey I guess that’s a real word) of Overwatch-obsessed portions of the Internet, you might have seen the occasional still of McCree looking like he just opened the Ark of the Covenant. Video via this Reddit thread. People love to pass around this shot and others like it because, hey, it’s really funny! Why the long face, McCree? Also, why the long fingers bending backward as though recently pulverized by a bowling ball? Do you need to go to a hospital? Do hospitals perform exorcisms? What did you see behind The Curtain? Why did you decide to step outside the mortal plane, knowing that the grim toll would be a skeleton made of snakes? This, however, is not a glitch. These sorts of animations are in Overwatch for a reason: personality. Despite spending most of their time running around and shooting each other, Overwatch’s characters put most video game casts to shame. Why? Because Blizzard squeezes larger (and sometimes noodlier) than life personality out of everything they do. Visual designs and verbal quips are the obvious parts. There are plenty of animation tricks, however, that you don’t even normally see. Or at least, you don’t know you’re seeing them. During a GDC talk recently made available to the non-GDC-attending public, senior animator David Gibson broke down a few of the animation techniques the Overwatch team is using. 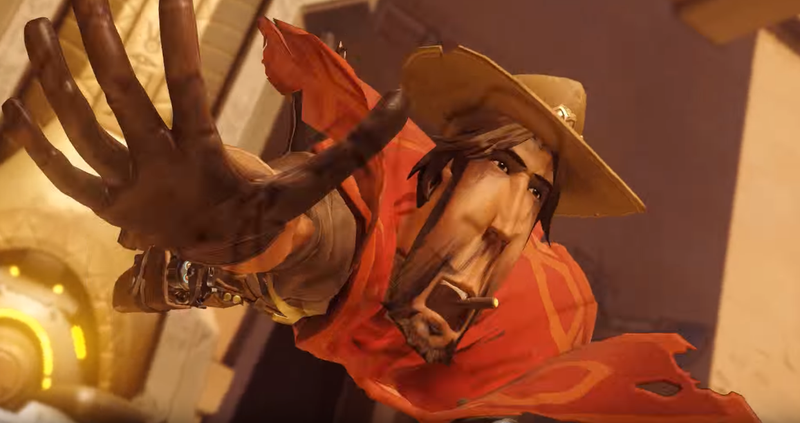 In the above video, McCree looks like the cowboy son of a wacky waving inflating arm-flailing tube man and Stretch Armstrong because of smear frames. Smear frames only show up for the briefest of instances in order to emphasize an action, to exaggerate momentum and mass. As you might have noticed, they often defy what we might consider, you know, physically possible. Somewhat notoriously, action-focused anime uses smear animation all the time. Case in point: two infamous stills from Naruto. Out of context, they look hilariously bad. In motion, though, they help the show’s fight scenes to appear more fluid and stylish. 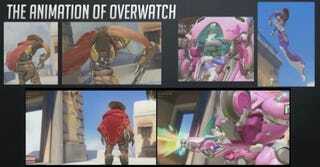 In Overwatch, smear frames typically end up in Play Of The Game poses and other places where the camera is fixed. After all, they’re meant to be viewed in very particular ways. If a player could see them from other angles, Overwatch would probably be reclassified as a horror game. Smear frames, in addition to another technique known as “squash and stretch,” are responsible for some of Overwatch’s most iconic animations and poses... that just so happen to look incredibly silly when stopped or slowed down. In traditional animation, these techniques are fairly common. The reason they’re notable here is that they don’t show up all that often in 3D video games. The best part? Portions of characters’ skeletons actually are noodles. Well, more or less. “[In our character rigs] we have these bones right on top,” Gibson said. “We call them noodle bones. I think most places call them noodle bones. They’re right on top of the arm bones, and we have them all throughout the typical character, down through the legs.” Those bones can kinda do their own thing alongside characters’ regular skeletons, giving motions extra oomph. So there you go. The next time you laugh at one of these stills, you’ll at least know what you’re laughing at.